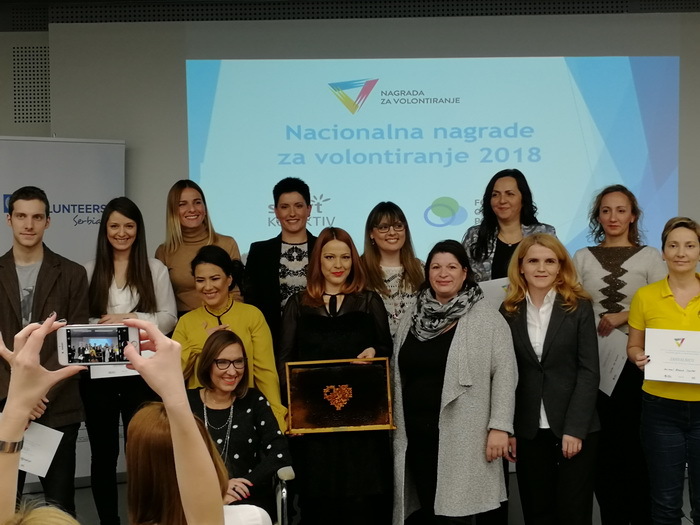 Belgrade, December 6, 2018 – Responsible Business Forum and Smart Kolektiv handed out National Volunteer Award at an event held at the United Nations building on the occasion of the International Day of Volunteers. The main award in the category of organizations was given to the association Translation Heart, which gathers about 500 translators who volunteer in translation of the medical documentation for treatment abroad. Also, awards were handed out to the Milan Petrović School of Primary and Secondary Education in Novi Sad, while the Award for Corporate Volunteering was given to the L’Oreal Adria-Balkan company, for the activity that was organized at the Inclusion Center Meeting Place in Zemun Polje. Irena Pavlović, the founder of the Run Art, community for working with women from the Safe House for Victims of Domestic Violence, was given recognition for the volunteer of the year, while the special recognition for contribution to the local community was given to Srećko Zdravković for starting the initiative Youth in Center. The participants of the event were addressed by Hans Friedrich Schodder, acting Resident Coordinator of the United Nations in Serbia, Sanja Putnik, Assistant Minister, Ministry of State Administration and Local Self-Government, and Željka Ćirić Jakovljević, Member of the Governing Board, Responsible Business Forum.